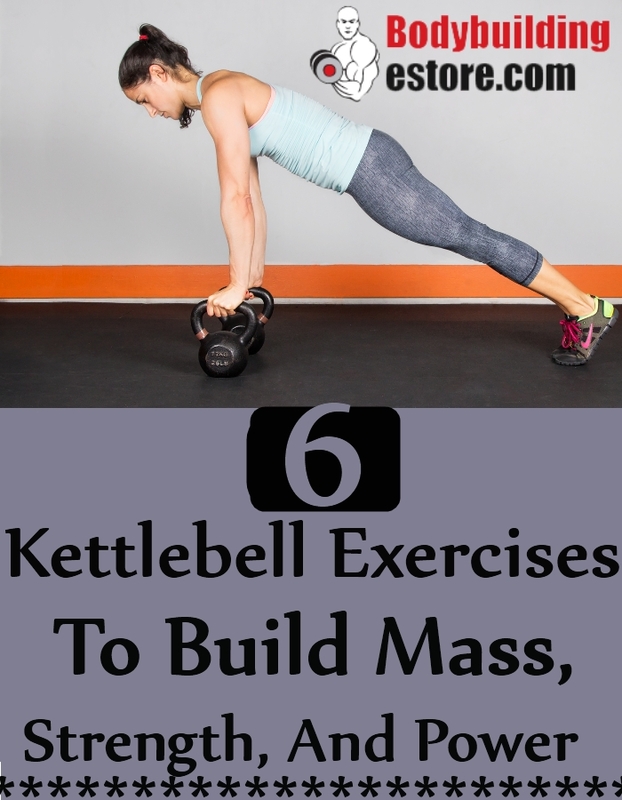 If you love to do cardio, you must include kettlebell exercises. These workouts are said to be most effective when you are trying to build strength, power, and mass. It is not just about burning calories at a quick rate, but all about your overall fitness, great strength, and stamina. Kettlebell exercises are never boring, they are available in great variations. Include these workouts in your regular schedule and burn more calories, build mass and power. These are suitable for bodybuilders and sportsperson alike. This is an effective exercise which targets back, arms and ab muscles directly. It helps in building strength, power, and mass for all the muscles, thus helping to improve performance. To do the workout, you need to lie down on the back. Your legs shall be straight and out. You will again extend your right arm and keep it straight, as you hold on to a kettlebell in your hand. You will slowly bend the left knee and then start to rise. Your left arm shall be in motion as you ensure that your body is propped up. You will get a good feeling about the burn in your abs. This means you have targeted the muscles most accurately. Sit up straight throughout and then get back to the start position. You need to repeat at least 8-10 times for your each side. This exercise will target all the inner back muscles, the glutes, and the leg muscles. 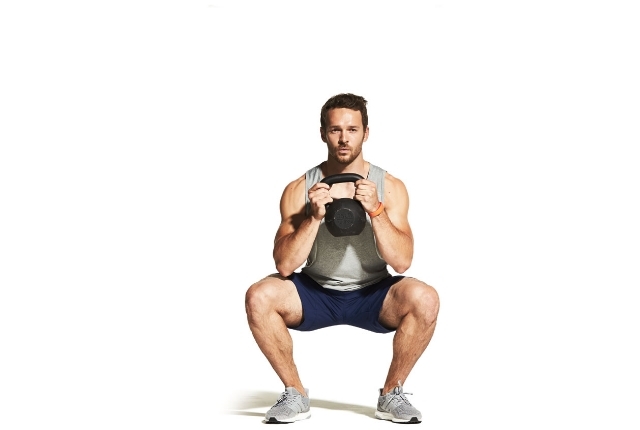 To start the workout, you need to get into a squat position. Squats are most effective when you have a kettlebell in hand. Keep the kettlebell just in front of your chest using your both hands. Keep your elbows close to your body. 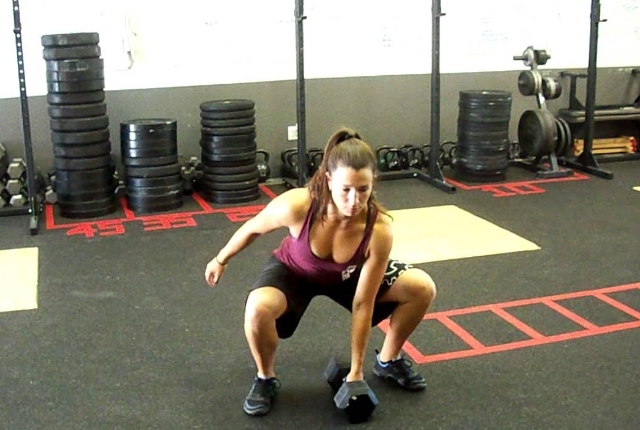 You can start the squat by slowly moving your heels and bring it close to the ground. You can push your hips slowly back till the thighs are totally parallel to ground, or they are just below the ground. You can get back to the standing position. You need to repeat the workout at least 15-20 times. Remember, you shouldn’t hurry because it is always about the quality of workout which matters and not the quantity. This is a simple exercise and can be done by beginners too. Start the workout by holding two kettlebells in each hand. You can place a foot on one bench. You need to slowly lift your body from the ground. You will use the support of your leg for generating power. As you are on the top, you can switch your feet and move down with the opposite leg. You need to repeat the workout for your other side. Repeat at least 8-10 times for each side. This exercise helps in building power and strength to your whole body. To start the workout, you need to start by keeping your feet, at least hip distance apart. You will have a kettlebell in your right hand. Keep your arm bent and rest the kettlebells over the shoulders. You will hold out your left arm for good balance. You need to squat down as you send the hips down and bend your knees. You should maintain a tight core and your spine should be neutral in this position. Stand comfortably and then squeeze your glutes, as you push the kettlebells straight upwards. You need to extend the arms so that the bell is directly overhead. You can lower and then slowly repeat. Your entire movement will be smooth as much as possible. You need to do at least 6-8 repetitions and then switch the sides. Crunches are always quite popular and the best way to build power and strength to your muscles. Start the workout by lying with your faceup on the ground. You should lift your straight legs up. They should be forming a 90-degree angle with the torso. You need to hold a kettlebell using your both hands. You can extend the arms straight up and above the chest. You need to crunch up in this position. Slowly raise the shoulders and your upper back from the ground. You will be lifting the bell closer to your feet. Now, gently lower and then repeat. You need to keep your arms extended throughout the workout. Repeat at least 8-10 times. This exercise targets the shoulders, legs, glutes, arms and back muscles. Stand straight as you hold a kettlebell in front, with your hands. Your arms shall be bent. Your palms shall face one another. Now, you need to lunge a bit forward with a leg as you slowly raise the kettlebell just above the head. 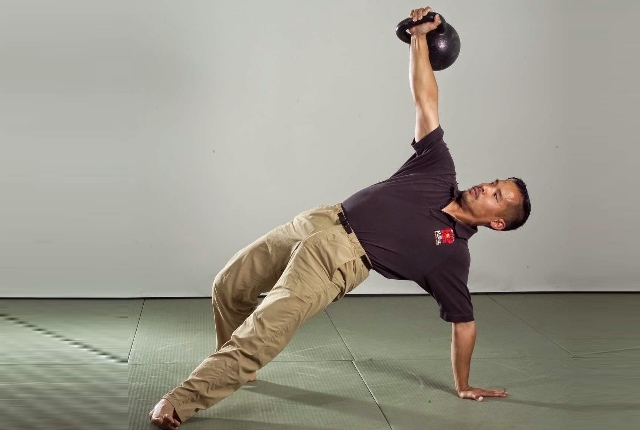 You can get back to standing position as you return the kettlebell to the chest. You need to repeat at least 10-12 times.